01/13/2019: Moved Ford 40-17017 Wrench to Other Production. 04/02/2011: Added a Moore Drop Forging 6 Inch Stillson Pipe Wrench. 08/15/2010: Added a Moore Drop Forge 5/8x15/16 Spark Plug Wrench. 06/21/2010: Added link to period advertisement. 08/31/2009: Moved to separate page, still under construction. 03/16/2009: Added a Moore Drop Forge Open-End Wrench. 03/07/2009: Added a Ford 40-17017 Spark Plug Wrench. 04/18/2008: Added a Moore Drop Forge 12 Inch Pipe Wrench. The Moore Drop Forging Company was founded in 1900 by Arthur L. Moore as a merchant drop-forge operator, with an initial location on Birnie Avenue in the Brightwood section of Springfield, Massachusetts. A 1902 report from the Massachusetts Tax Commissioner listed incorporation date as October 15, 1900. A 1903 directory of iron and steel operators, published by the American Iron and Steel Institute, noted the company as a maker of steel forgings for bicycles, automobiles, and machines, with an annual capacity of 500 tons. The advertisement at the far left was published on page 24 of the November, 1914 edition of American Exporter. The illustration shows two of the monkey wrenches offered by Moore Drop Forging, one with a steel handle on the left and a wooden handle on the right. The second advertisement at the left, published in a 1915 edition of American Exporter, shows a Stillson-pattern pipe wrench offered by Moore Drop Forging. In 1967 Moore Drop Forging was acquired by the Eastern Stainless Steel Corporation, a maker of stainless and specialty steels, and by 1969 the company had been restructured as the Easco Corporation. Easco continued the Moore contract for production of wrenches and socket tools for Sears, and also offered a line of hand tools under the Easco brand. The company registered a trademark for their M-Circle logo, with the first use listed as 1908. The M-Circle logo will be found marked on both Moore's own tools and as a forge mark on some of their contract production. On March 22, 1913 the company filed an application for a "Morco" trademark to be used on a line of pipe wrenches. The notice at the left shows the application as published by the USPTO on June 17, 1913, but we haven't found the actual registration number yet. Currently we have no catalogs for Moore Drop Forging. Fig. 1. Moore Drop Forging 6 Inch Stillson-Pattern Pipe Wrench, with Insets for Side View and Marking Detail. Fig. 1 shows a Moore Drop Forging 6 inch Stillson-pattern pipe wrench with a wooden handle, stamped "Stillson's Wrench" with "Made by Moore Drop Forging Co." and "Springfield, Mass. U.S.A." on the shank. The overall length is 6.0 inches closed and 7.0 inches fully extended. The finish is plain steel. Fig. 2. Moore Drop Forging 12 Inch Stillson-Pattern Pipe Wrench, with Insets for Side View and Marking Detail. Fig. 2 shows a Moore Drop Forging 12 inch Stillson-pattern pipe wrench with a wooden handle. 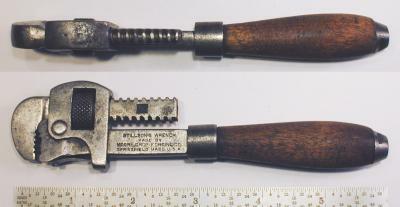 The shank is stamped "Stillson's Wrench" with "Made by Moore Drop Forging Co." and "Springfield, Mass. U.S.A.", followed by the M-Circle logo (see middle inset). The M-Circle logo also appears as a forge mark on the movable jaw of the wrench. The overall length is 12.0 inches closed and 13.8 inches fully extended. The finish is plain steel. In this section we'll show some examples of contract production by Moore Drop Forging. The extensive production for Sears Roebuck is documented separately in our article on Craftsman Maker V tools. Fig. 3. Walden OR916 1/2-Drive Ratchet, with Insets for Reverse and Side View, ca. 1930. Fig. 3 shows a 1/2-drive Walden OR916 female-drive ratchet acquired as part of a No. 16-R socket set from around 1930. The shank is marked with "Walden Worcester" forged into the front, with "Made in USA" forged into the reverse. Note also the M-Circle logo forged into the reverse shank at the right. The overall length is 10.5 inches, and the finish is cadmium plating. Walden is not known to have had much (if any) drop-forging capabilities and therefore turned to other companies, in this case Moore Drop Forging, when forged parts were needed. This ratchet can be seen in context as the Walden OR916 Ratchet in our article on Walden. Fig. 4. Moore Drop Forging "Ford" 5/8x15/16 Spark Plug and Head Bolt Wrench, with Insets for Side View and Marking Detail. Fig. 4 shows a Moore Drop Forging "Ford" spark plug wrench, with measured openings of 5/8 on the hex box end and 15/16 on the open end. The shank is marked with the "Ford" script name forged into the top, with the M-Circle logo and a "50" code forged into the reverse. This was a very familiar wrench for Ford Model T owners, as it was intended for servicing head bolts and spark plugs. Fig. 5. Moore Drop Forging 9N17014 11/16x1-1/16 Open-End Wrench, with Inset for Reverse Detail. Fig. 5 shows a Ford "FoMoCo" 9N17014 11/16x1-1/16 open-end wrench, made for Ford by Moore Drop Forging. 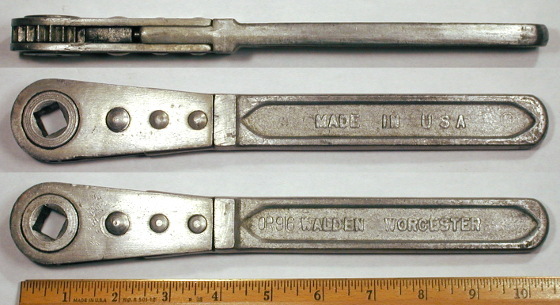 The wrench is marked with the FoMoCo logo and "USA" forged into the shank, with the M-Circle logo and "15" forged into the reverse. The overall length is 10.5 inches. The finish is plain steel with traces of the original black paint. Fig. 6. Moore Drop Forging 9/16x5/8 Open-End Wrench. Fig. 6 shows a 9/16x5/8 open-end wrench made by Moore Drop Forging, marked with the M-Circle logo and "30" forged into the shank. As long as we're showing examples of contract production by Moore Drop Forging, it's worth noting that there were other companies using a similar "M" forge mark (without the circle) that made comparable tools for Ford. Fig. 7. Ford 40-17017 11/16x1 Spark Plug and Head Bolt Wrench, with Insets for Side View and Marking Detail. Fig. 7 shows a familiar wrench for Ford spark plug and head bolt service, a number 40-17017 wrench with an 11/16 hex box end and a 1 inch open end. The wrench is marked with "M" and the model number forged into the reverse shank (see lower inset). The overall length is 10.1 inches. The finish is plain steel with traces of the original black paint. We got a note from the National Ford Tool Collectors (NAFTCO) that this wrench was probably made by the Manzel Forging Company or Michigan Steel Products Forging Company, but not by Moore Drop Forging as previously reported. We currently don't have any further information on these other drop-forge operators, so we'll leave this tool here for now.